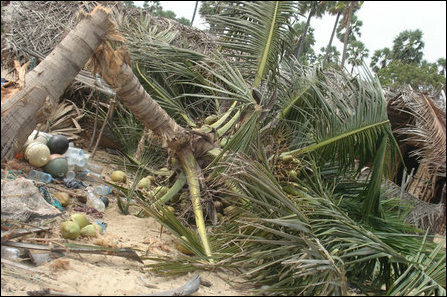 Sri Lanka Air Force (SLAF) bombers attacked Saturday a coastal area in Mullaiththeevu where thousands of civilians, recently displaced, had established temporary shelters. The bombers dropped eight bombs on fishing huts and boats, lighting up the stretch using para lights, causing panic among the refugees and the fishermen engaged in fishing at 4:55 a.m. 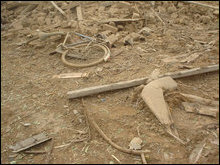 The bombers arrived again at 5:35 to bomb the area with 8 eight more bombs, targeting the temporary shelters of refugees. 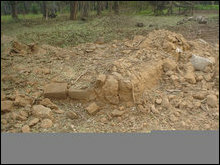 The SLAF bombers attacked Mullaiththeevu and Ki'linochchi five times within four hours in the morning. Meanwhile, the Sri Lanka Army (SLA) launched an artillery barrage from all the frontiers of Vanni from 4:20 a.m. till 5:50 a.m. 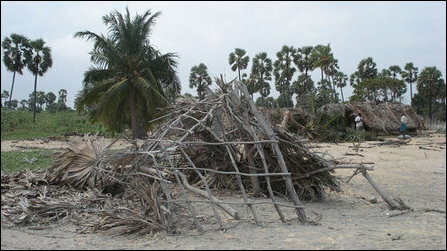 Temporary shelters were destroyed in SLAF bombardment coastal area in Mullaiththeevu. 3 civilians were wounded, according to initial reports. 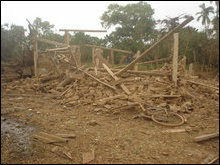 Several houses and huts were destroyed in the artillery barrage in Vadamaraadchi East in Jaffna district, Vaddakkachchi, Paranthan, Umaiyaa'lpuram and Iyakkachchi in Ki'linochchi district, and Mu'l'liyava'lai, Vattaappazhai and Oddichuddaan in Mullaiththeevu district. In the meantime, Sri Lanka Navy (SLN) claimed that it had destroyed a medium-size LTTE logistic vessel in the deep sea adding that it detected the vessel around 01:30 a.m., 70 nautical miles northeast of Mullaiththeevu. 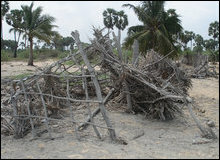 However, there was no explanation to the bombardment along the coastal stretch by the Sri Lankan military. The SLAF bombers targeted houses in Ki'linochchi town four times at 7:00 a.m. and the shelters of recently displaced in Vaddakkachchi - Ir'nai madu border thrice at 8:00 a.m. 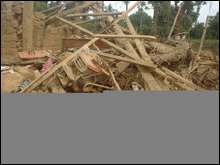 The shelters were destroyed in the SLAF bombardment in Vaddakkachchi - Ir'nai madu border.